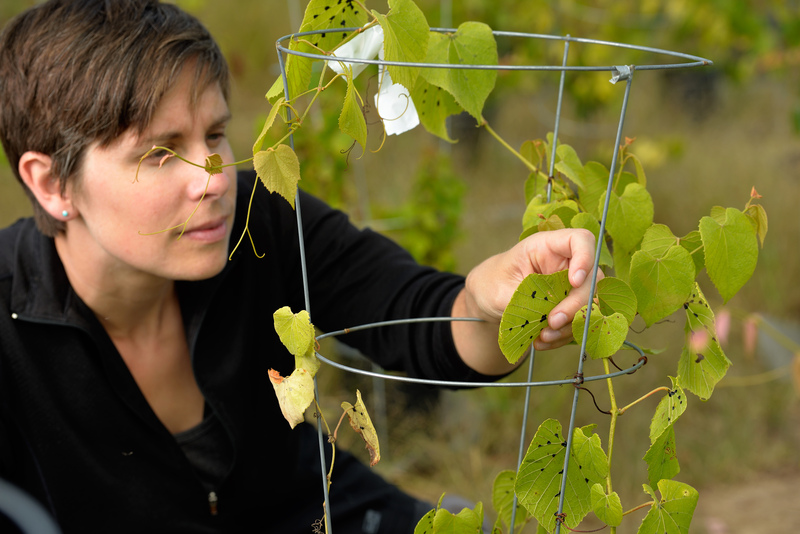 Michigan State University plant biologist Marjorie Weber is the lead investigator of a five-year, $1.1-million National Science Foundation Dimensions in Biodiversity grant to study the evolutionary dynamics of bodyguard reward traits of wild grape plants. The traits, or mite domatia, are structures on plant leaves that house beneficial mites. The mites, in turn, eat microbes and small herbivores on the leaf surface. Weber’s research studies the natural variation in domatia across wild grapes to understand how the plant traits function by affecting leaf communities. Bodyguard reward traits are among the most well-established forms of natural defense that have evolved in plants. Grape plants are especially important because some species have domatia and are defended by bodyguards, while other species, including many of the most economically important, do not. “This research will help us understand the biology of an interesting and ecologically important plant trait, while at the same time allowing us to test fundamental theory about the evolution of cooperation between plants and animals,” says Weber, who works in MSU’s College of Natural Science. The research will result in data on interactions between grapes, their herbivores, beneficial arthropods, and the leaf microbiome. The data will be made public and have the potential to inform grape agriculture and breeding. The project will also include the development of tools aimed at increasing the visibility of research in classrooms. Danny Schnell, professor and chair of MSU’s plant biology department, says the Dimensions of Biodiversity program is one of the most prestigious and competitive at the National Science Foundation. The grant begins in September.